Oil on canvas. 22.5" x 26.5" This work was exhibited by invitation at the Pennsylvania Academy Exhibition beginning on January 29, 1939. #1501 on back of work. #W39. Oil on panel. 28 1/2 x 52 5/8 inches. 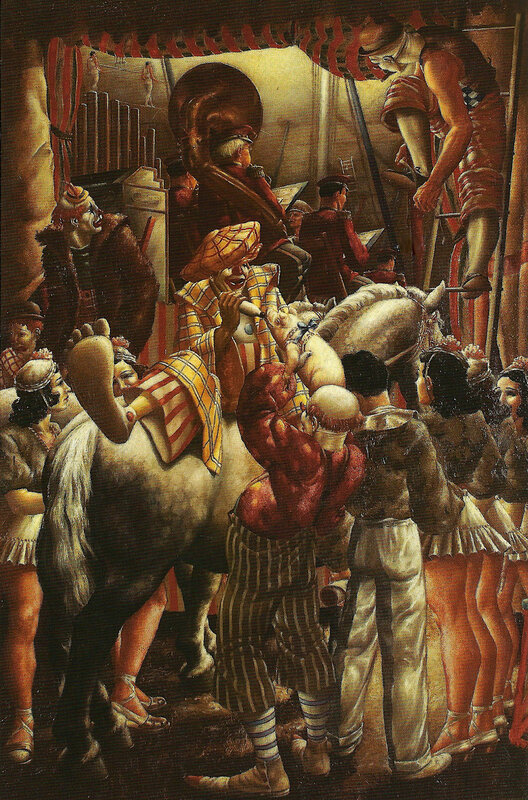 A portrait painted in tribute to the great German born clown, Otto Griebling. Awarded the Mrs. Donald M. Mattison Award at the Indiana Artists Club 38th Annual Exhibition. Also exhibited 9/25/77-1/15/78 at the artist's solo exhibition at the Indiana State Museum. #W157 This work is now available as a Giclee print. Please visit the Giclee Prints page on this website. Oil on panel. 28.75 x 22.75 inches. This is a wonderful example of REW's outstanding ability with color and composition. The subject pictured were in the millinery department of the William H. Block Co. of Indianapolis, IN. 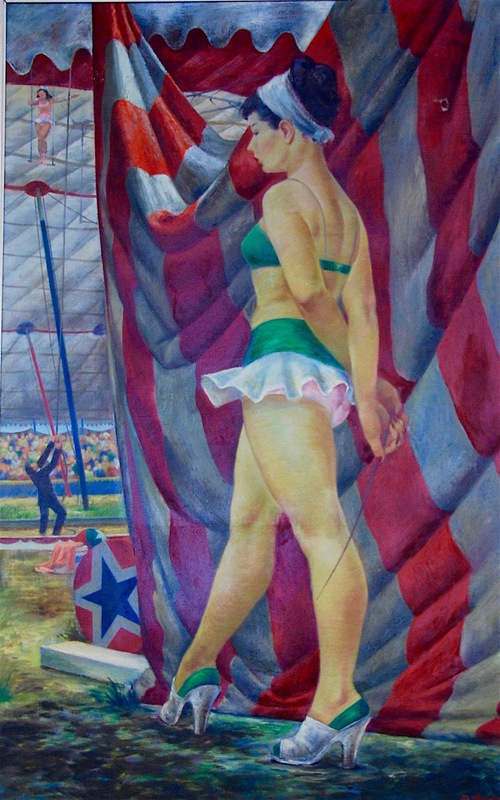 The work was exhibited at the Grand Central Galleries, NYC and the Hoosier Salon Exhibition 1/19—2/10/1951 #101 This work is now available as a Giclee print. Please visit the Giclee Prints page on this website. Oil on panel. 34 x 30 1/8 inches. Dated Nov. 15, 1939 on the reverse. Sold at Sotheby's Auction House, October 2, 2014. (private collection) See the "Drawings" menu to see the graphite study sketch for this work which is available for purchase. Oil on board. approximately 53 x 31 inches. Gifted by REW to the Peru, Indiana YMCA. Street urchins playing marbles in front of a wall sporting an old torn circus poster. 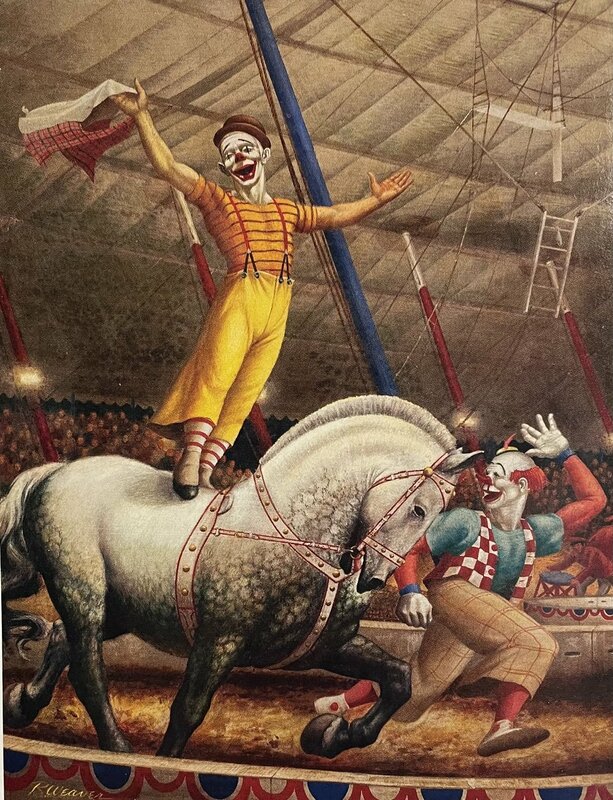 Somehow REW always worked the circus into the composition somewhere. #W139.